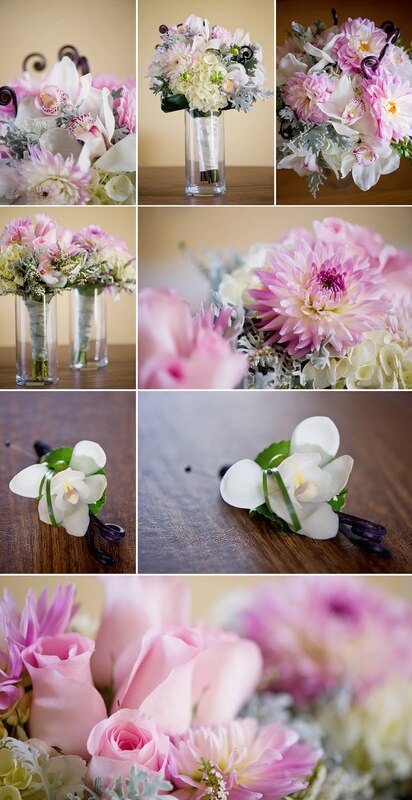 gold cymbidium orchids, orange wax flower, wisteria vine and dusty miller. cymbidiums with wisteria vine and bronze hypericum. bear grass, black ribbon banded with gold wire. And for the groom, a white calla lily. gold wire and gold pearl pins. roses, green hypericum. A great combination for the girls bouquets! cat tails, calla lilies, roses, hydrangea and aspidistra foliage. roses and lilies. A great bright fall combination. I had the opportunity to create some great arrangements for the "Pink Event"
gorgeous raspberry color cymbidium orchids and white nerine lilies. This was my first time to use my new white vases. I think they looked great. I can't wait to get more of them! We edged the aisle in the garden with petals and hanging glass bowls of roses, hydrangea and amaranthus. curly willow and lily grass swirling through the water. bells of Ireland, hydrangea and curly willow. Stems of the bouquets were wrapped with green satin and a lime pearl on wire. Attendant's bouquets complemented the bride's with green cymbidium orchids. vandella roses, white mini calla lilies and hydrangea. size of it, a challenge. The flower selection of green cymbidium orchids, phaelanopsis orchids. vandella roses, green hydrangea and crystal blush mini calla lilies.